JP 2007-05-01 600 points ? US 2007-08-20 ? points ? EU 2007-08-25 ? points ? AU 2007-08-24 ? points ? 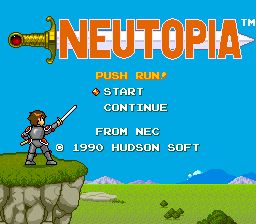 Neutopia, known as Neutopia: Frey no Shou (ニュートピア フレイの章) in Japan, is an action RPG game for the PC Engine and TurboGrafx-16. This page was last modified on 30 March 2019, at 13:51.